Happy Haloween! My third and final Halloween mani for this year. For this skittles mani I did a color block accent nail. I also used textured polish. I love this look! It took a while to accomplish due to the dry time for the textures, 1 hour, and allowing the accent nail to dry in between the 3 colors. I don't mind that it took longer because I'll be wearing it all weekend. This is for sure my favorite of the three Halloween colored manis I did this year. 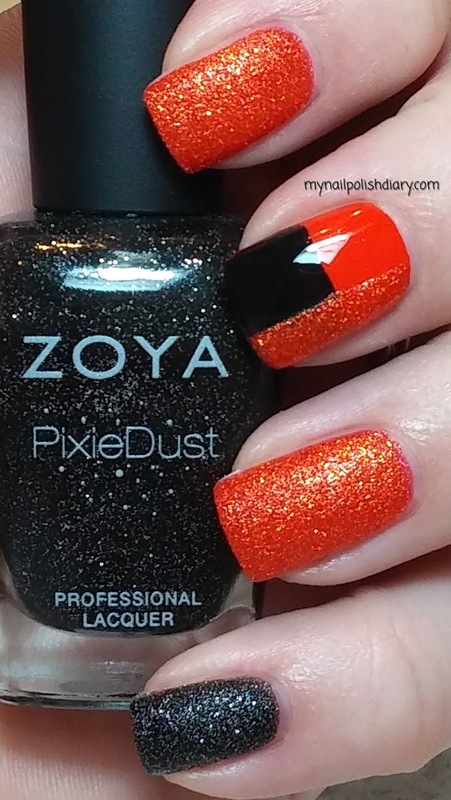 Zoya Dahlia is a textured black metallic with silver glitter. The formula was a little thick but not at all problematic. It applied like a dream. OPI A Roll In The Hague is a bright orange creme that is also perfect for a Halloween color. China Glaze Liquid Leather is a gorgeous, easy to apply black creme. Of all the black polish I own, this is probably my favorite. I used tape to block off the space for the colors on the accent nail. I applied OPI A Roll In The Hague on the entire nail for the base. Once that dried I taped off the nail and added China Glaze Liquid Leather. Once that was dry I once again taped off and added Zoya Dhara.